We're excited to announce the following features and enhancements implemented in the latest version of WhatsUp Gold. IT Network Administrators like yourselves helped choose many of the features that went into this release. We always want to hear from you to improve and make WhatsUp Gold your "one-stop" solution for network management. Make sure to join and participate in the Ipswitch Community to provide feedback on future releases, or consider joining our beta program by contacting our support team. The Ipswitch Community spoke and wanted a better way to quickly setup Application Monitors. The user Interface for Application Monitoring Add On has been updated in 2019 to simplify workflows and improve usability. Now you can more easily monitor Microsoft, Oracle, Linux, and Java-based applications and services to assure optimal service levels to your users. 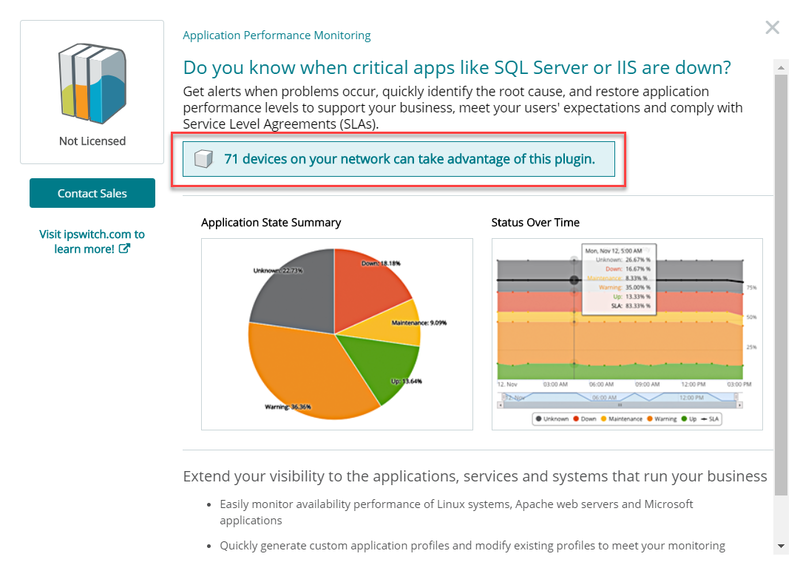 High-level application status can immediately be seen on the map and device list when the application monitoring overlay is enabled. You also now have complete control to edit each monitored application, as well as discover applications running in your network you may wish to monitor. Want a way to see everything WhatsUp Gold is doing in the background? WhatsUp Gold Live allows you to see activity occurring in all areas of the application in near real-time. This feature is an alternative to navigating through several windows and reports, and you can now more easily discover issues which may have been difficult to see. 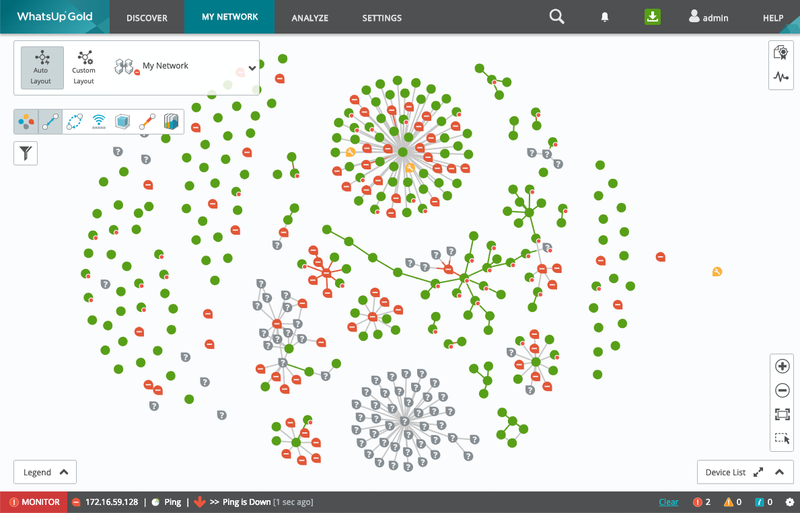 We've added more controls for you to design custom network maps the way you want to see them. WhatsUp Gold 2019 now includes 'Snap to Grid' for more precise control when moving and aligning devices and annotations. Maps now include higher zoom levels to more conveniently view complex networks. The grid can now be turned on or off and will scale with other elements on the map while zooming. To help streamline the look of your custom maps, you can automatically change all device names to uppercase. We've taken the headache out of needing to review various logs and activity by consolidated logs into a single full-page report. You can sort by Log Name, Severity and Time. It is critical for Network Administrators to recognize and pinpoint suspicious traffic which can put their network at risk and lead to security breaches, threats or damage. Suspicious Traffic Report reveals traffic and conversations with suspicious IP addresses inside or outside your network, allowing you to act quickly and take appropriate measures to correct the threat and minimize damage. A new IP Reputation library gives you control over suspicious IP address lists with the ability to retrieve up to date blacklists from trusted sources or create your own. In combination with this report, you can also configure and send alerts based on abnormal user network behavior patterns. With WhatsUp Gold version 2019, this monitor now supports additional authentication methods for NTLM challenge-based authentication. 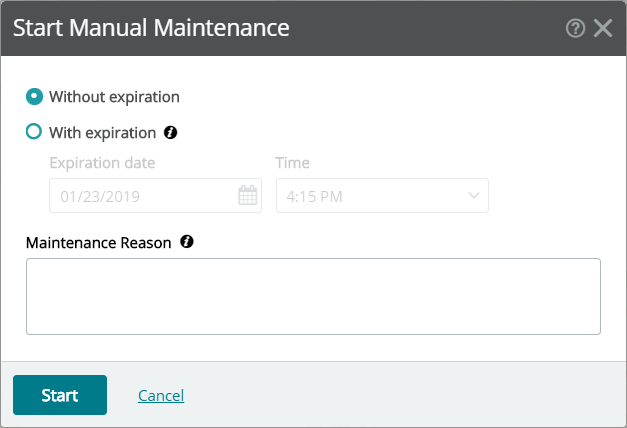 You can now enter a Reason when placing a device into Maintenance Mode and view these reasons in the new Maintenance Mode Report. Keep track of why devices are in maintenance and simplify communication with your team. WhatsUp Gold now includes support for Aruba's extensive series of wireless access point devices. Devices in Maintenance report displays a list of all devices currently in Maintenance Mode. You can now apply a Brand to a device and access the Brand Library directly through the Device Properties window. The new NTA IP Reputation Library in WhatsUp Gold gives you control over suspicious IP addresses lists used in the Suspicious Traffic reports and monitors. With the IP Reputation Library, retrieve up-to-date blacklists from trusted partners and stakeholders of the Internet community, or create your own blacklists. These IP addresses are used as a reference for considering network traffic that might be suspicious via Suspicious Traffic Report and alerts. Compare selected differences, view, manage, and export running and backup Configuration Archives from a new dashboard. View configuration archives from multiple devices in one convenient report. Discovery reveals when devices qualify for environment-specific Add Ons and monitoring. This is available in the Analyze menu under the WhatsUp Gold Add Ons category. We're committed to building the best in class software for network and application monitoring. See a problem, or an area in need of improvement? Participate and post your suggestions in the Ipswitch community. We're listening. The user Interface for Application Monitoring has been updated in 2019 to simplify workflows and improve usability. WhatsUp Gold Live Activity is a new feature that allows you to see activity occurring in all areas of the application in near real-time. This feature is an alternative to navigating through several windows and reports, and you can now more easily discover issues which may have been difficult to see. Custom Maps have been improved with "Snap to Grid" functionality and the ability to display all device names as uppercase. The grid can now be turned on or off and will scale with other elements on the map while zooming. Suspicious Traffic Report reveals traffic and conversations with suspicious IP addresses inside or outside your network, allowing you to act quickly and take appropriate measures to correct the threat and minimize damage. Enhanced HTTP Content Monitor now supports additional authentication methods for NTLM challenge-based authentication. You can now enter a Reason when placing a device into Maintenance Mode. Devices in the new Maintenance Report displays a list of all devices currently in Maintenance Mode. The new NTA IP Reputation Library gives you control over suspicious IP addresses lists used in the Suspicious Traffic reports and monitors. WhatsUp Gold has added support for Aruba wireless access point devices. WhatsUp Gold 2018 Service Pack 2 and 3 installers caused the installation to abort on upgrades and fresh installations with "Failed To Load InstallLicensingUtils.dll". An error was generated when WhatsUp Gold was installed with no specified IIS role. The nightly cleanup on the host table caused a timeout when the database contains a large number of flows. All trace activity is now saved to a file when using debugging. The trim command in the default script would trim output unexpectedly for Cisco devices. Each run of a backup job would create a new archive if the backup contains double-byte characters. Users were prevented from saving a copy of results to... in New or Edit Schedule Task. Users were prevented from saving copy of a config to a new file location if a backup already exists in the database. Added ability to gather service tag information for Dell PowerEdge R710. Warnings were generated during schema check validation. Custom sorting in reports was prevented from being retained when reopening or exporting. Alert Center errors were prevented from displaying non-ASCII characters correctly. Windows Services report was prevented from displaying data seemingly at random from run to run. Connecting scalability pollers to WhatsUp Gold servers on the same domain have been corrected. WhatsUp Gold was prevented from retrieving CPU utilization date from an EXSI hosting using SNMP credentials. The Forwarding Table Inventory was incomplete on the H3C (HP 3Com) switch. WhatsUp Gold was assigning the incorrect role (Windows 8.2 vs 10) to a device depending on the combination of credentials used. The Polling Controller and occasionally other services would crash on C++ code (ispa13). Custom filtering in dashboard reports was not retained when reopening or exporting. Preconfigured dynamic group names have been shortened to better fit within the device tree and report filters. Exporting report data to PDF would cause an error when the Device Information and Status report was included as part of the dashboard. The SNMP MIB Manager would display errors and warnings in good files. Qualified WhatsUp Gold 2019 with Microsoft SQL Server 2017. The Device Information Card was prevented from displaying all information when selecting a device using the 'include devices in sub-groups' option. WhatsUp Gold was prevented from displaying serial numbers for APC UPS devices in the Asset Inventory report. 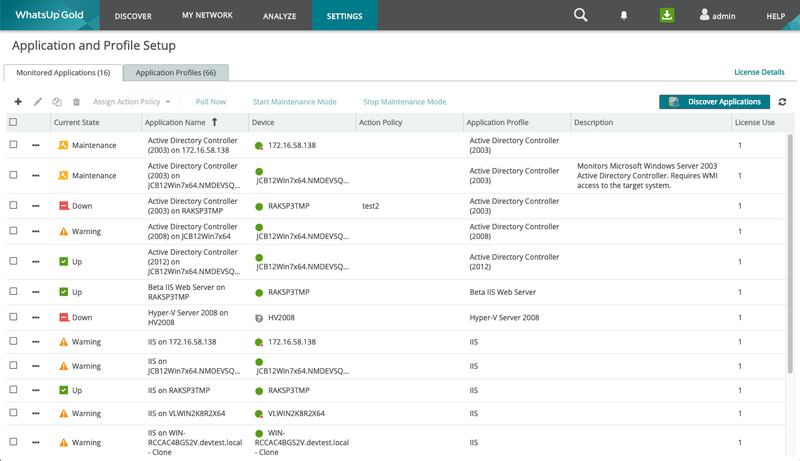 The SNMP Interface Performance Monitor would not work properly with Meraki devices. A BFC error in the web occurred when attempting to change passive monitor assigned actions after selecting a group. An error occurred when rebuilding groups and links and how they appear in the Auto Map view. There was an issue with case sensitivity with the Process Active Monitor. Discovery was prevented from successfully discovering all Hyper-V guests. Some service active monitors were prevented from working as expected following upgrade. WhatsUp Gold would check the Tor node list even if the Tor threshold has been removed. The date/time column was prevented from being displayed in the Configuration Management Policy Audit report. NMConfig and RemoteDBConfig would fail when the SQL user password contains a semicolon (;). Windows Event Log monitor was preventing text in the Rules Expression Editor from being retained. Credentials were prevented from being applied properly during Discovery. The user was prevented from deleting premade and custom link lines in the custom map view. SNMP active monitor errors were being generated. The option for 'Down if the process is running' no longer worked with Process Monitors. 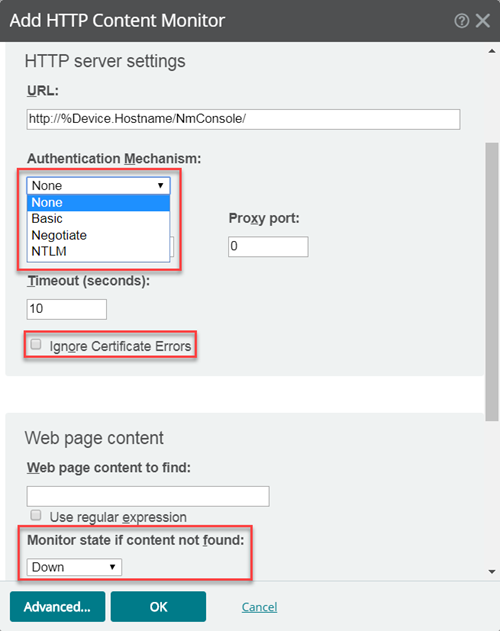 Discovery was incorrectly assigning device roles based on SNMP responses. Unnecessary errors were appearing in Logger Health Messages, "Value was either too large or too small for an Int64". The WMI Service Monitor failed due to an Invalid Query. Filters for specific interface numbers against roles prevented from working properly. Device Rescan caused Active Monitors to be added without Use in Rescan enabled and without role assignment. Installed software information was inconsistent between Device Scan and Discovered Network Device interfaces. Characters in Active Monitor arguments caused problems following an upgrade. The Interface Utilization performance monitor was added to newly-discovered Windows devices with incorrect polling protocol. Device Details would load slowly when device group access rights were enabled (except for the admin account). An extremely large database (32K devices) caused NmPollingController to crash on startup. The HTTP Content Monitor would fail with a timeout and too many redirects. "Refreshed" devices would be added to the root group in WhatsUp Gold when Discovered Devices were missing. Added the ability to limit access to Service Agreement expiration information in the WhatsUp Gold web interface. Upgraded to Visual Studio 2017 Runtime Libraries. Added support for new Aruba Instant Access Points (OID 1.3.6.1.4.1.14823.2). The Virtualization Sync task would generate "Virtual Monitoring is not enabled" errors in Logger if the user was not licensed for Virtual. Important: After upgrading WhatsUp Gold, please restart the WhatsUp Gold server and clear the cache and local storage for browsers on all machines that will access the WhatsUp Gold server. For more information about what is needed to operate WhatsUp Gold, see System Requirements.